One of the problems with making podcasts and videos is where to record the audio and video. Few can afford a dedicated, purpose built soundproof studio. There are options from a desktop microphone isolation shield made from about US$12 of material to a mini-recording studio costing thousands of dollars. For audio only, you can use a "Microphone Isolation Shield". This is curved sheet of sound absorbing material placed around three sides of a microphone. You place your head into the open side and the material shields much of the extraneous noise. 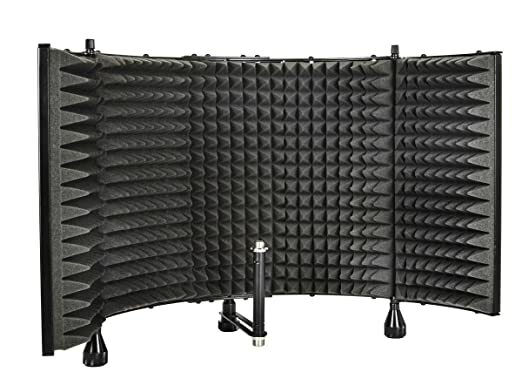 These cost around US$100, but one of my colleagues has built one from acoustic foam panels (about US$12). This might be used for a talking head video, by placing the camera at the back of the shield. But it would be better for a voice-over of a slide show. On a larger scale the Inspire Center at University of Canberra have a library style carrel covered with carpet. It is remarkable how quiet this is when you sit in it, with the material on the side walls and top absorbing outside noise. With a suitable backdrop, this could be used for video as well. The Inspire Center also has a "podcast" room, which is essentially a small soundproof audio recording studio. This is needed for recording high quality podcasts. Otherwise stray sounds, which are not evident to someone in the room can be distracting on recordings. One step up are the telephone box sized radio interview booths at the Australian Broadcasting Corporation, colloquially known as a "TARDIS". These are lined with acoustic panels. The booths are used for audio only, but with a backdrop this set-up could be used for a talking head video.